A second date. In Las Vegas. So this one time, I went to Las Vegas on a second date. And by ‘one time’, I mean last month. While everyone at home was sweating it out during Brisbane’s mini heat wave and struggling through another week in the florescent-lit version of hell known as work, I was on what goes down as one of the most epic second dates. EVER. In fact, I may never get another date—not because I got hitched while I was there (incidentally, there are more than 300 weddings A DAY in Vegas), but because no one else will know quite what to do with me. So, whether my date wants me or not, he may end up stuck with me. Generally most people—unless they’re part-way through a Contiki, Fanatics or Topdeck tour or on a reality TV show—don’t embark on international travel with someone they’ve been dating for less than a week, but I’ve never been much of a stickler for the rules… and there’s few things I love more than a holiday romance. So when—after an alcohol-fuelled first date at the Bledisloe—my latest eHarmony date offered to take me to Las Vegas for four days, I hesitated for about 0.025 microseconds before whipping out my passport. I mean … it’s Vegas. Within 48 hours, he was stateside for a work trip and I was booked on a Virgin Australia flight bound for sin city. And while I didn’t really ‘know’ him, we were one of eHarmony’s famed ‘compatibility matches’ which meant we had a lot in common, and we had already spent more than eight hours in each other’s company (which I’m pretty sure took about six weeks to achieve with the last guy I dated). I knew his favourite colour (sky blue) and, in what was a bit of a weird twist on your standard first date, I’d met his parents. And his aunt. And a group of his mates. Plus the parents of someone with whom he went to school. While my friends bombarded me with calls for a police check, I felt confident I’d be okay—there was a long paper trail connecting me to him so I figured the chances that I’d end up as the dead body in a CSI episode were slim. That’s not to say I didn’t have second thoughts—about 12 hours before I was due to leave for the airport, I sent him a message saying I’d skip the trip, re-pay the cost of my ticket and see him when he got back. But he talked me around and the following morning, armed with a few summer dresses, a killer pair of heels and a hug from mum, I hit the airport. 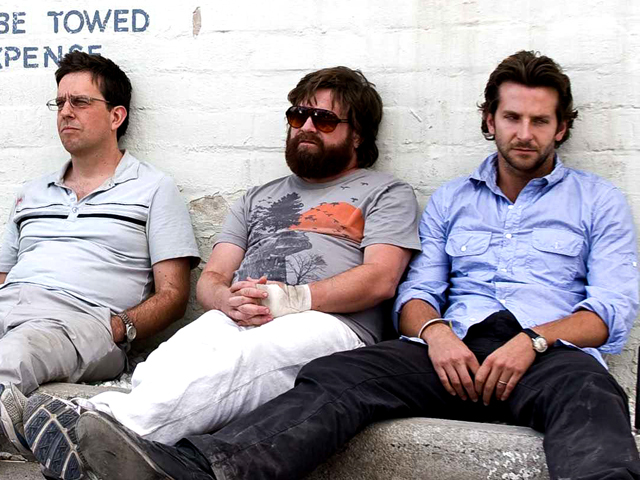 Seventeen hours later, I landed in Las Vegas and met up with the man and his best mate (I’m going to call my date Phil and his best mate Alan after the boys in The Hangover) and the three of us jumped in a black stretch limo and headed for the strip. Yes, I did crash a boys’ trip away which in hindsight, probably isn’t something I’d recommend most people do on a second date. Or ever. The first thing I discovered is that Phil doesn’t do things by halves (as if booking me an international flight didn’t prove that)—not only did he have twice as much luggage as me (ha! ), but we were staying at Bellagio with rooms facing the iconic fountains. The last time I was in Vegas, I was 15, so the landscape along the strip changed—and this time around I could drink AND gamble. Although the only thing I was betting on was that this trip wouldn’t be a complete dating disaster! That night, after checking out a private party by the pool at Encore—complete with a trio of very attractive women playing pop songs on electric violins—we headed to the final night of the three-day Life is Beautiful Festival to see the Foo Fighters. Going to a concert with a guy is one of those things I’ve always wanted to do; I’m not sure why exactly, but there always seemed something cool about listening to a band while having someone wrapped around you. Clutching cocktails—the signature Life is Beautiful Dutch Mule (vodka, ginger beer and lime)—we made our way into the crowd and I got my concert moment. He even lifted me up so I could see Dave Grohl over the sea of shoulders which I’m accustomed to! The next three days passed in a whirlwind of hangovers, shopping, eating, gambling and more drinking. As far as getting to know each other went, I probably came away not knowing much else about him than when I left, except that he likes pina colada daiquiris and thinks good girls like bad boys (an issue we continue to debate). Having kept my alcohol consumption fairly low-key for the first few days due to a fear that I’d again end up on the bathroom floor trying to work the shower with my foot, I cut loose on the last night at the insistence of the boys who probably weren’t quite prepared for the whirlwind of dance moves which followed. Or the speed at which I polished off almost three jumbo size pieces of pepperoni pizza. Three hours later, Phil and I had had our first disagreement—one of those great drunken ones which make little sense when you’re sober, I had almost no skin left on the back of my heels from my dancing shoes and it was time for bed. There’s no denying it was quite a second ‘date’—we shopped, we ate, we drank and flew over the Grand Canyon in a helicopter—ticking another item off my bucket list. And we even managed to steal some time without his best mate around (there were moments when I felt like I was on a Bachelor style group date!). And on Wednesday night, we made it to the airport in one piece. Just. Someone came pretty close to throwing up out the cab window and it wasn’t me (and yes, we arrived in a stretch limo and left in a cab … that’s what Vegas does to you). So, the big question … was it worth the trip? Of course! He’s a great guy, I had a memorable few days, ticked something else off my bucket list and ended up with a great story to tell for years to come. Yes things may have been different if we’d gone somewhere just the pair of us, but it was also good (at times) to have a third person to bounce off—even if I did feel like I was in a group date worthy of The Bachelor! But I’m fairly sure this is how we looked at the airport waiting for our flight out. As to a third date … who knows. Paris anyone? Just kidding! We’ve been in touch and caught up for a drink, so we’ll see what happens—as I said a few weeks ago, it’s just a date, even if it was a big one! To catch up on my eHarmony #SingleInTheCity adventure from the beginning, click here or to read my interview on the eHarmony blog, click here. This post was brought to you by eHarmony. Please support the brands that support this blog. Thanks Amy! Welcome to the blog. Hopefully I can keep entertaining with my crazy stories! Wow – what a date! A little bit extreme but sounds like fun. Whoa, I would never be that brave with someone I hardly knew. It sounds like you had a great time. I have to check back and see how things are going. Glad I found your blog & thanks for linking up on Sunday’s Best. Thanks gigglesnkisses. I’ve always been a sucker for a holiday romance, this was just faster than normal. And we did have mutual friends which made me feel safer. But spoiler alert… We aren’t still dating. But I’m still glad I went. Thanks for popping by.